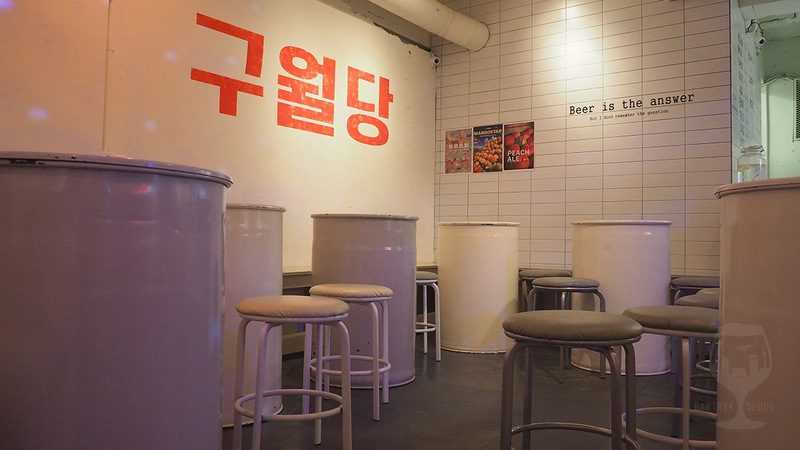 Just a few minutes stroll from Sinnonhyeon station and the wide Gangnam streets, September Brewing’ own taproom is located on a smaller side street. Downstairs from a surprisingly anonymous entrance is a brutally decorated basement, with painted barrels as tables and a festive disco ball. 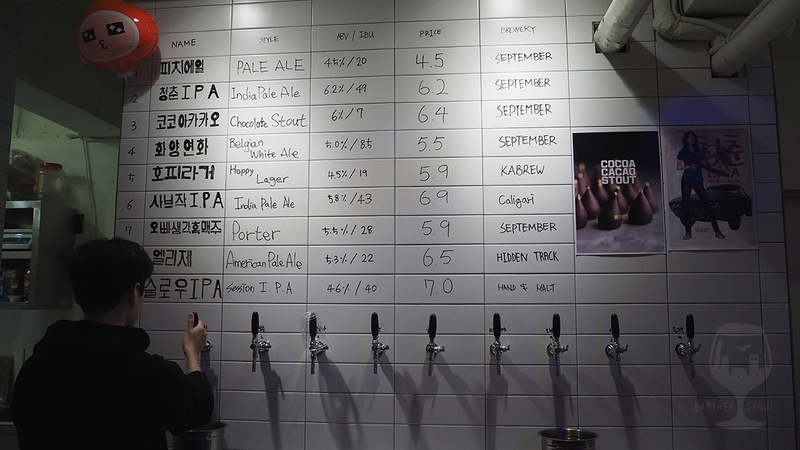 On tap is a selection of Korean beer, naturally dominated by September’s own, but you can also get beers from Kabrew, Caligari, Hidden Track and Hand & Malt. Adding to the festival/backyard theme, all beers are poured in plastic cups, which you pick up at the counter. Most of the surfaces are white and picks up color from the various light sources, successfully adding up to a relaxed, but trendy atmosphere. 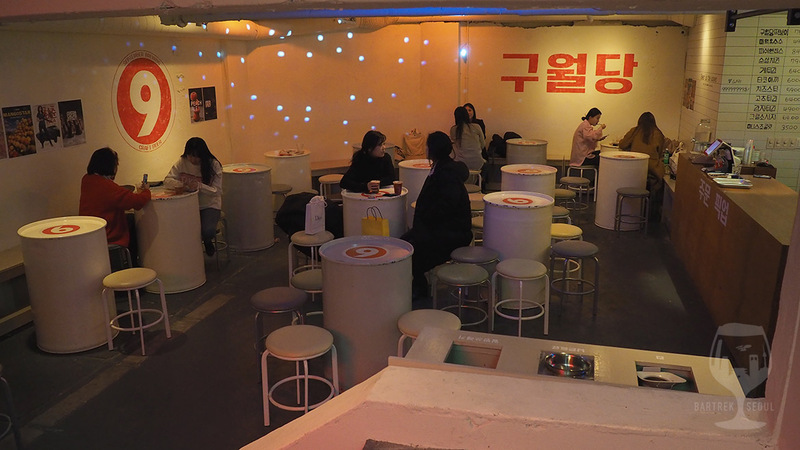 There is also a food menu, written only in Korean, where you can pick up some classic Korean side dishes as well as a few western ones. 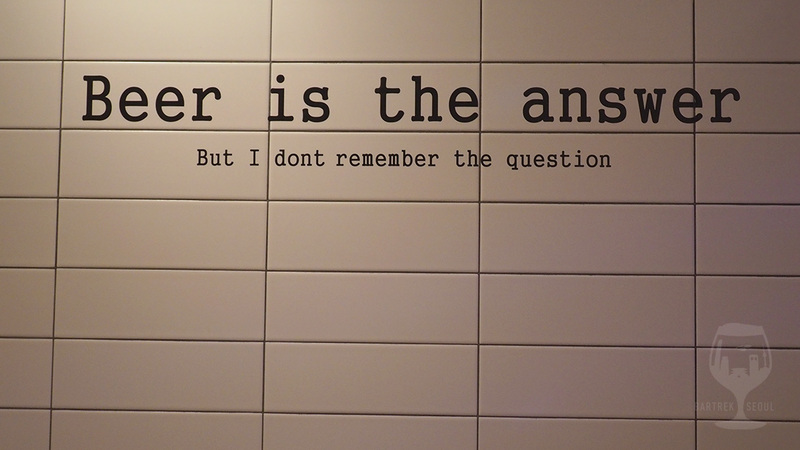 Tap menu written on the tiles. The food menu is only in Korean. 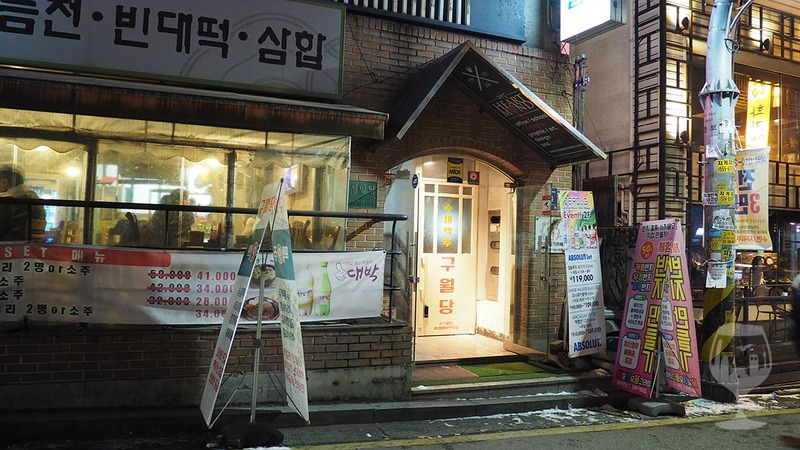 They have stuff like tteokbokki (spicy rice cakes), steamed corn, fish and chips, takoyaki, donkasu, sausages, french fries and deep fried stuff. 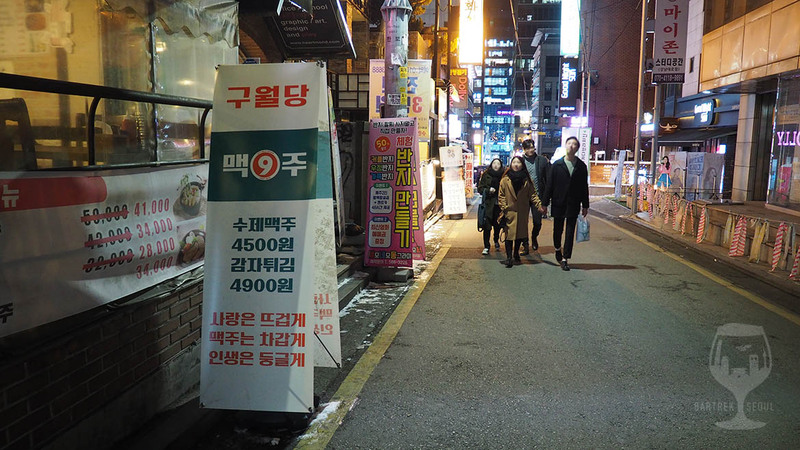 Prices are quite fair compared to many drinking places. 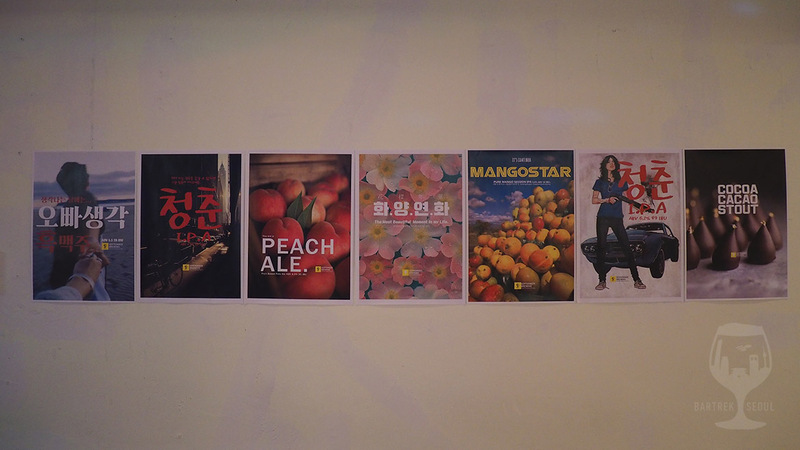 We started off with September’s own IPA and Peach Pale Ale, both solid choices from their ale-dominated menu. The IPA is dark and rich, fruity with a strong body, hoppy overtones and a gentle, roasted malty aftertaste. The Peach Ale is sharper, and as the name suggests, fruity! It is a weaker beer, at a comfortable 4,5% abv, but is tastefully citrusy and bitter. 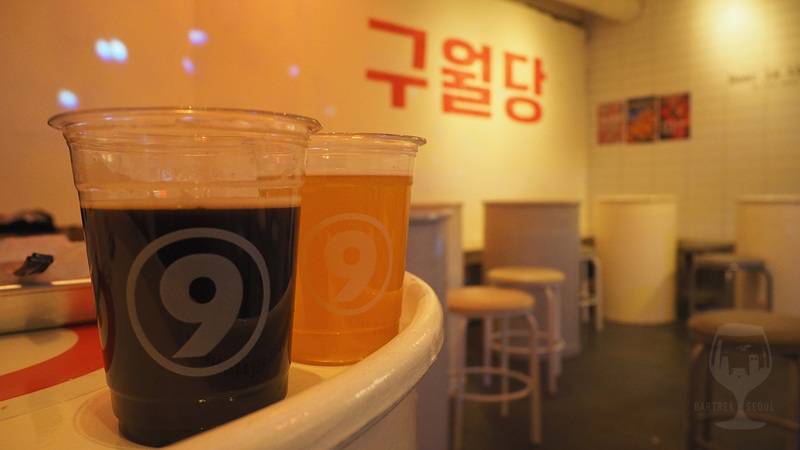 No glassware here, only plastic cups! We got fish and chips dish to have on the side. Not a bad deal for 5,900 won. 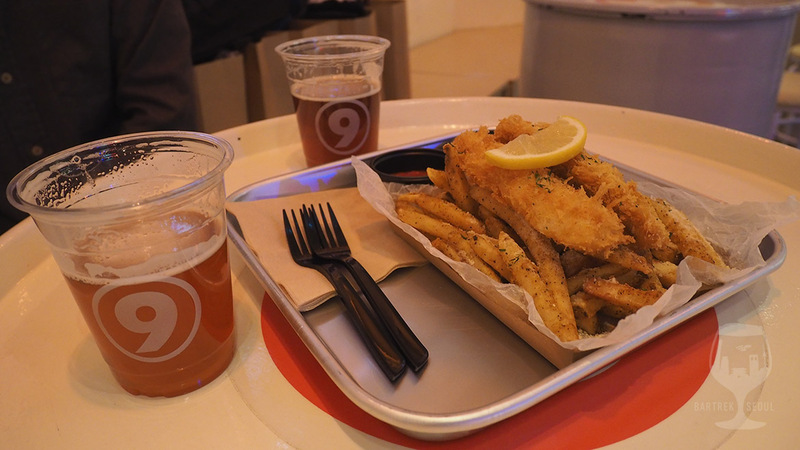 The fish and chips go well with the interior, further adding to the festival feeling. Rather than one wide filet, the fish is cut in two long pieces – perfect for sharing! Fresh lemon, ketchup and sauce elevate it from simple street food to a fitting side dish. While the place was empty when we arrived, it was dinner time on a Wednesday, definitely not a typical rush hour. More guests arrived after 7 and the place began to slowly fill up. The music was modern and a little loud, but enjoyable from time to time. The concrete walls and hard surfaces make me wonder what the sound level will be like when this place fills up during the weekends. 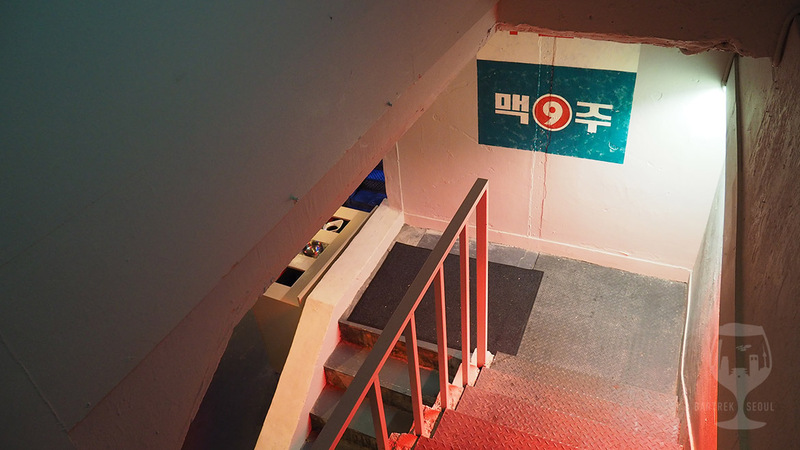 구월당 (guwoldang) painted on the wall. Guwol is september in korean and literally means “ninth month”. Appropriate poetry on the walls. Their posters are quite simple. Second round of house beer. For our second round, we got the Chocolate Stout and Belgian White Ale. At only 7 IBU, the stout is quite light and sweet, reminding me more of Hershey’s Kisses than a typical stout. Being a 400ml pour, the sweetness gradually took over the flavor the more I drank. 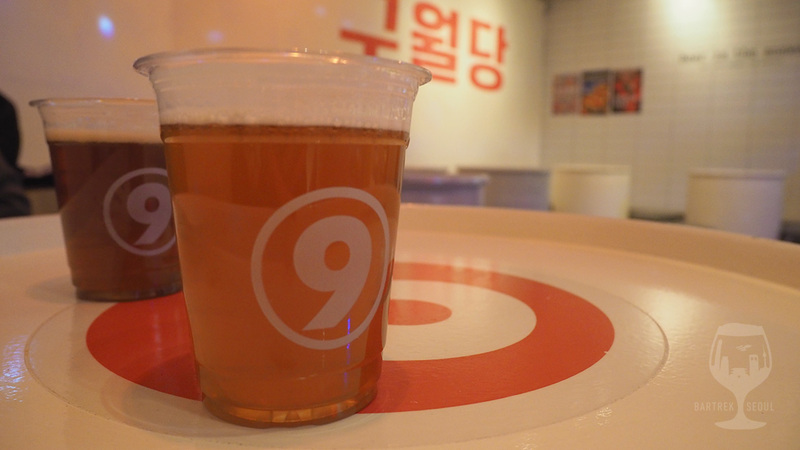 The Belgian White Ale was surprisingly sour, but with a weak body and mild aftertaste, it was quite refreshing. Our first set of beers were better hits, and makes me wish we could have ordered a sampler set before getting full size pours so we could enjoy the variety without committing to a big glass of each. The place started to fill up after dinner time. Disco ball is always a plus! The bar is not that big. They have no windows as it’s in the basement floor. They are located in B1. 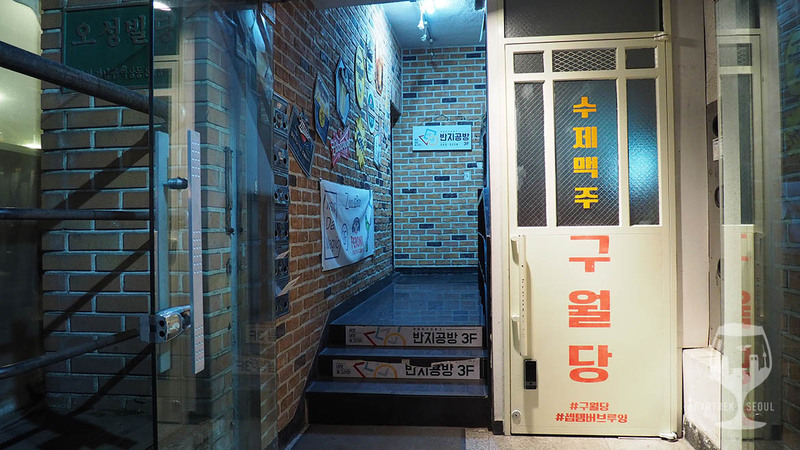 The entrance door says nothing in english so it might be hard to spot for those who can’t read Korean. The sign on the street has no English either. 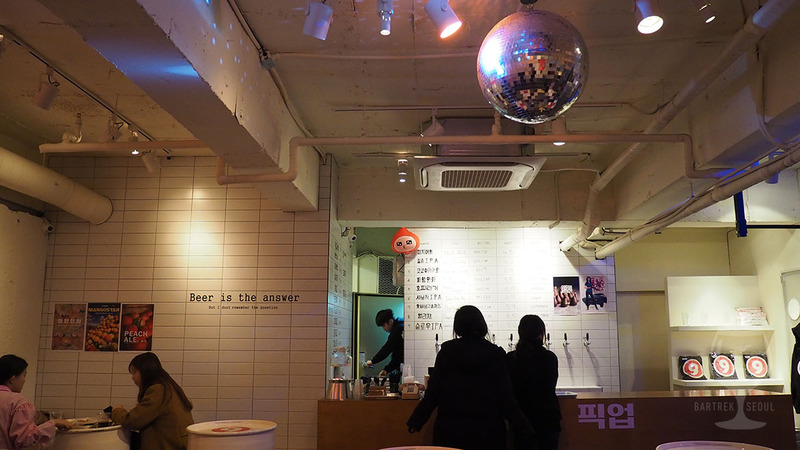 They are advertising their low prices; craft beer 4500 won – French fries 4900 won. White door is the entrance to the pub.